Well, that of course is up to you and your other half, but the Tarot does give you an indication of what is likely to happen to a long-term relationship. The somewhat cynical message from the Tarot can be seen here in the form of The Lovers and The Devil, where the playful Gemini twins morph into inhibited Capricorn. 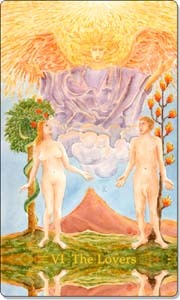 The Lovers depict Adam and Eve in Paradise overlooked by archangel Raphael. It's a bright, sunny and optimistic card. Choices to be made, but the potential and outlook seem rosy and happy. Fast forward a few months or years, or any timescale that has led to a change in the relationship. 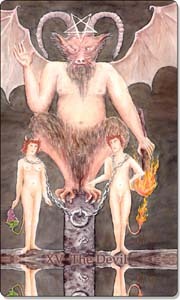 The Devil depicts a couple in chains. The background is all black, and it is the demonic figure of Baphomet, who has taken over from angelic Raphael. A grim but archetypal outlook for a couple in love, their destiny foretold by the wisdom of Tarot time and time again. Also note the numerical connection of the two cards: The Devil is number 15 in the Major Arcana sequence; 1 + 5 = 6, the number of the Lovers. Yes, long-term relationships have the tendency to go stale and boring. The Devil suggests that in relationships many people become complacent and take the other for granted. Over time, couples even become dependent on each other, used to each other and lack the energy to get out of the tedious rut. Instead, there is a tendency to find pleasure in activities outside their marriage. The Devil card in a love reading may not be such a good thing, but thankfully with Tarot this card can be a wake-up call to make some positive changes, to bring the spark back into a relationship As long as there is love, there is hope for good intentions and perseverance to succeed. "A married man should forget his mistakes; no use two people remembering the same thing." "A woman has got to love a bad man once or twice in her life to be thankful for a good one." "I have noticed ... that men usually leave married women alone, and are inclined to treat all wives with respect. This is no great credit to married women. Men are always ready to respect anything that bores them." "A husband is what is left of a lover, after the nerve has been extracted." 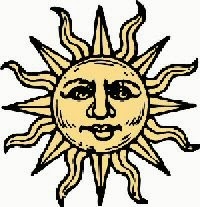 Do you feel the Tarot accurately depicts the course of long-term relationships? What are your ideas about why The Lovers and The Devil images are connected by their similar imagery? Ha ha, Zsa Zsa Gabor has hit the nail on the head - she always comes up with corkers! Really nice looking blog you have here!